The system can be supplied as an additional option for the powerful Cadfil-Axsym package or can be sold as a separate package. 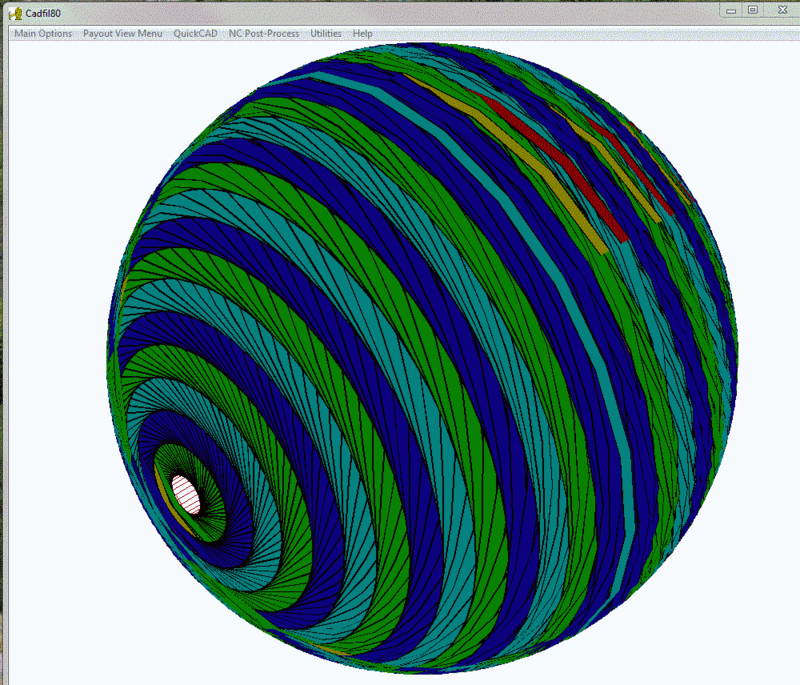 Sphere winding has a quick and simple parametric programming interface. The advanced 3D graphics and visualisation are the same as the world leading Cadfil-Axsym software. 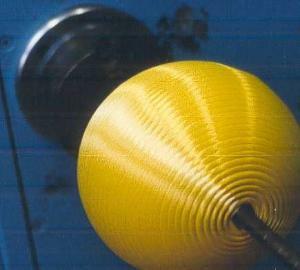 This sphere, shown left, is 280mm in diameter and was wound with 4 rovings of 167tex aramid. The wind is 8-9mm thick all over with 26 layers. The winding time was less than 35 minutes. With the Cadfil Sphere winding software, the control program was generated in less than 2 minutes and could be transferred to the winder to produce this winding, with no modification. Winding programs are created with a number of layers. A series of different winding angles is used, ranging from low pole to pole windings, to hoop windings around the equator of the sphere. Highly efficient quasi-isotropic laminates can be produced with near uniform thickness. These structures are capable of withstanding enormous internal or external pressures. The user specifies properties such as the fibre band width and thickness, the sphere geometries and machine clearance parameters. The user can then specify the wind angle of each layer, or automatically let the software determine the winding angles required to achieve a uniform thickness. A full winding pattern is generated that can wind all the layers and layer transitions without any stops. The vessel can have equal end openings or can have one open end (for a fill tube or boss) and one fully enclosed end. Vessels can be wound in carbon, glass, Kevlar or other high performance fibres. Other Spherical parts in Toray T300 carbon made with Cadfil software, with a wall thickness of 6mm and an internal volume of 1 litre, consistently had burst pressures well in excess of 3000bar (45,000psi). The Band simulation in the Cadfil screen grab below, is built up of 15 layers shown in different colours. You can note some vestiges of the transition circuits in different colours also. The transitions allow the 15 layers to be wound continuously without pause. The simulation and program was created in one minute!